Served with a delicious side salad this really is the perfect lunch, however as the omelette cooks quickly, it requires all ingredients close to hand. Whisk the egg whites in a glass bowl until light and frothy. Pour the oil onto a 16cm non stick pan and heat over a medium heat. Add the butter and when frothy pour in the egg mixture, move a fork quickly through the eggs in small circles until the eggs are nearly cooked through. Season with Bio Seaweed Salt and pepper, then sprinkle with cheese and chives. 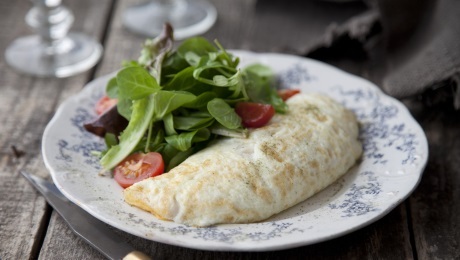 Remove from the heat and using a spatula fold the omelette in half and allow to settle for a further minute or two. Transfer to a serving plate and serve immediately with some green salad leaves.